It has been a long summer for me and @surgeoninkicks. Our blog content has been lacking. The weather is cooling and the leaves are turning the characteristic yellows and oranges of fall. While most of us have been in “back to school” for a few weeks already, we would like to bring you a few of our favorite bags (not necessarily purposed for scholarly pursuits) in an occasional series we are calling Bag to School. 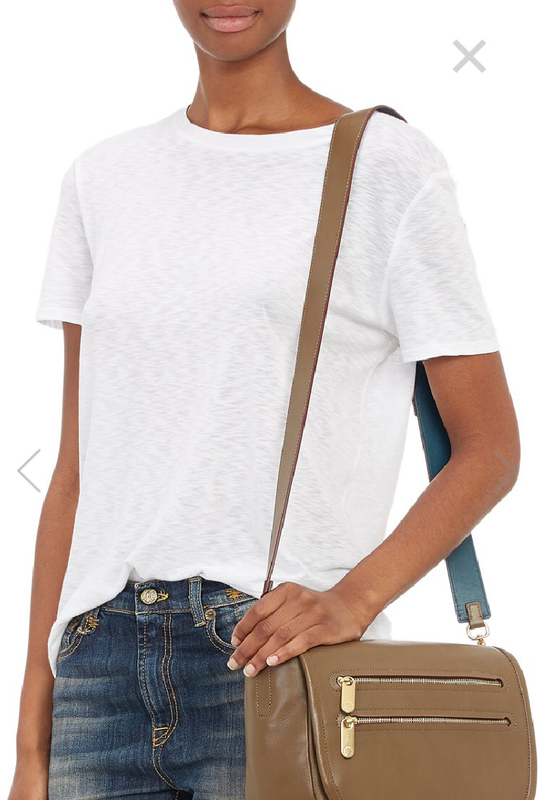 I have spent quite a while searching for the ideal go to crossbody day bag. A bag that let’s you be comfortable and hands free while say exploring an unknown city or on a daylong shopping excursion. I wanted a bag large enough to hold a thin hoodie in case it gets cold as the sun sets, a camera to commemorate the day, sunglasses (and the big cases aviators demand! ), etc. all with easy access to your cell phone and wallet without rummaging. I rejected a few crossbodies for size and still others lacking organizational capacity. At the end of the day, the resason why I rejected my last two crossbodies was that they would be very painful on my clavicle by the end of the day. The soreness of the clavicle bruise would last for days. 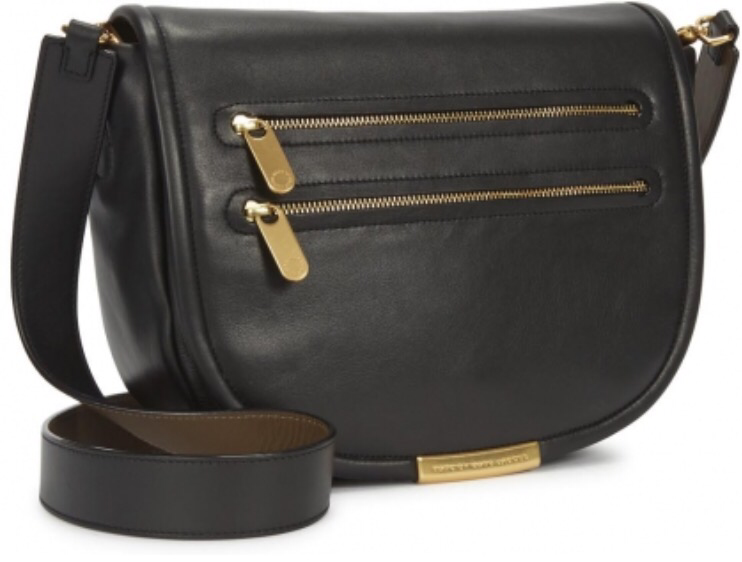 Recently, after months of holding out for the ideal crossbody day bag I came across this Marc by Marc Jacobs Luna Messenger Bag. First of all, the wide leather straps attached by rotating hooks and grommet is super comfortable. It is adjustable and removable though I am not sure what the point of it is without the strap as it is way to big to function as a clutch. Importantly, the strap never digs into my clavicle. I can wear it for hours without any battle scars! 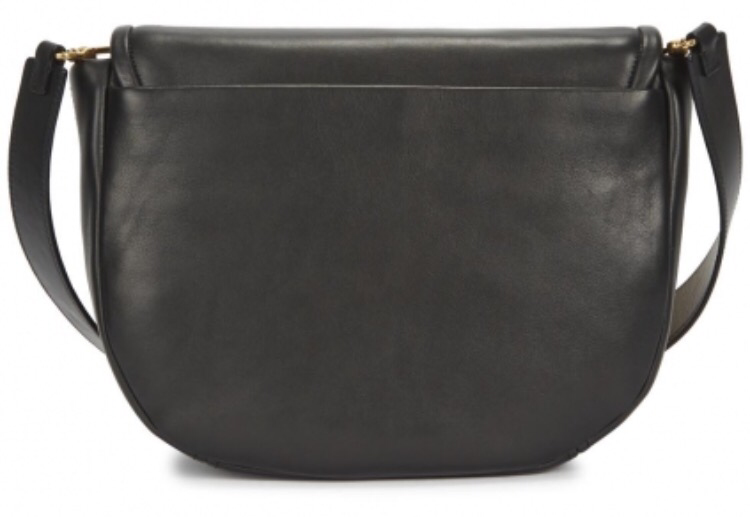 It has two large interior pockets along with two slip pockets to store small items and an interior zip pocket. The interior is a nice deep burgundy canvas. The exterior is a buttery black leather as soft as a baby’s bum. 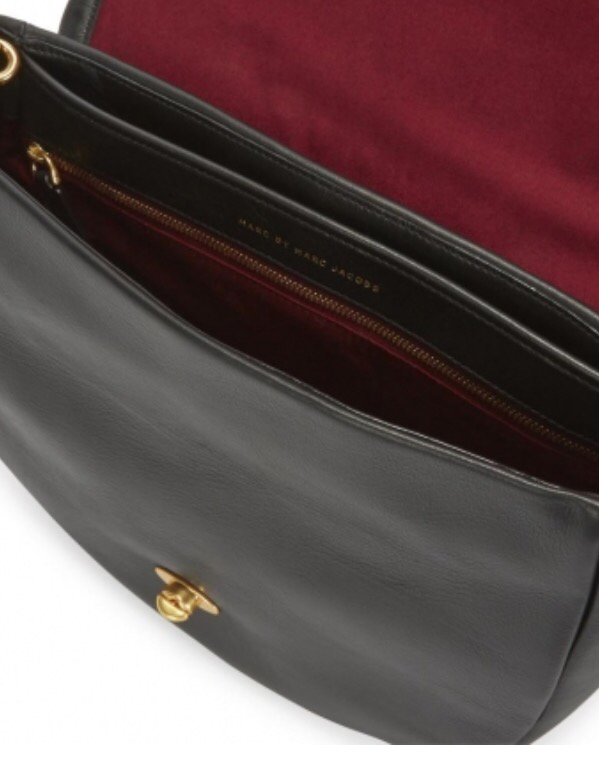 There is an exterior slip pocket and two zipper pockets on the flap. The gold hardware is it strong and the zippers work smoothly. I personally prefer gold hardware on all of my accessories. And the gold on this bag has a nice, not too shiny, matte finish and the logo is not obnoxiously large. I can fit a day’s worth of gear comfortably in this bag. It’s good for sporty days like the one with me above and for something slightly more chic like the model below. This is a well made bag that I am certain will give me years of use. 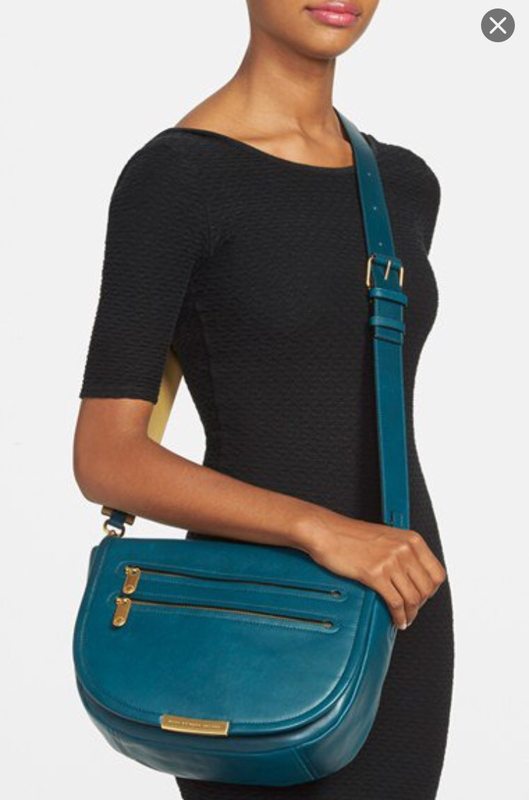 Alas it appears to no longer be available at Nordstrom (where it was also offered in a teal color–less versatile in my opinion) so keep an eye out for it at the Rack. But it is evidently still available at Barney’s in a more versatile khaki color. Though honesty why is that woman (and the chic one pictured above!) not wearing it crossbody style?! For me that’s the whole point of this bag. I would not own it has it not been for its crossbody feature. This entry was posted in Accessories, Fashion and tagged Barney's, black leather, Bloomingdales, crossbody bag, day bag, Marc by Marc Jacobs, Marc Jacobs, Neiman Marcus, Nordstrom, Nordstrom Rack, The Rack by surgeoninheels. Bookmark the permalink. This looks like the perfect bag! I have a definite weakness for bags. 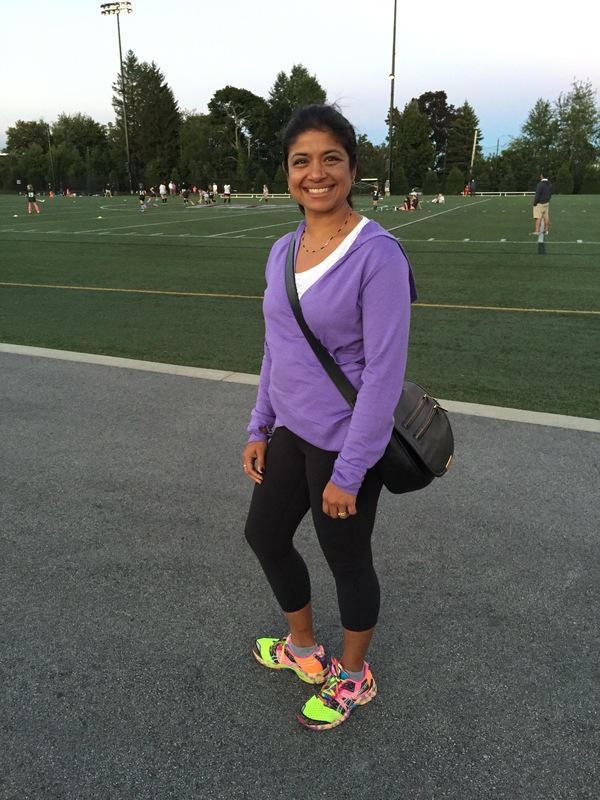 The one you featured here looks very versatile… pretty and functional! 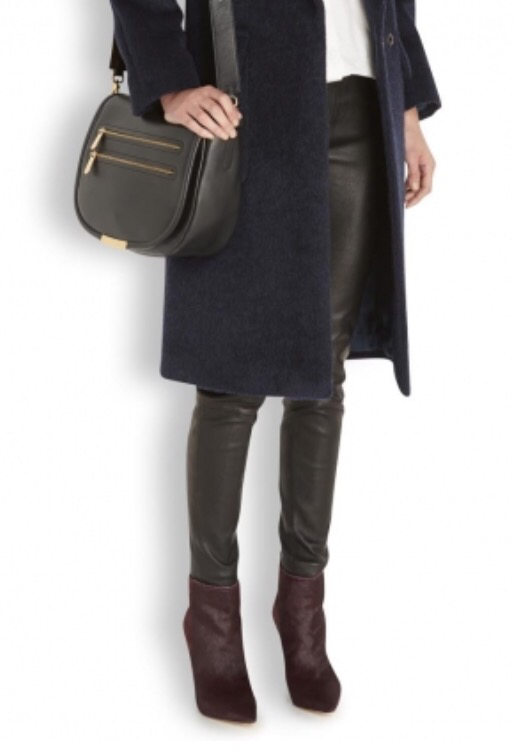 I have a Proenza Schouler bookbag that I love. I’m able to cram a light sweater in there, plus my day planner, a camera, wallet and phone. And you’re totally right about the clavicle soreness! Major issue with bigger crossbody bags!